Who loves a good Oreo? Its probably safe to say 99% of the population adores them (For real, who ever eats only the suggested 2 cookie serving size?!). 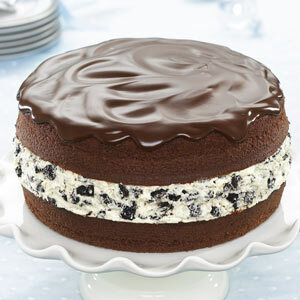 Who loves a good cake? Once again, is 99% of us a safe bet? (I don't always know the serving sizes of cakes, but I probably often go at least a little over. So what if we put the two wonders together? Is it possible to put that much goodness together or would it cause a complete overload of greatness and just explode? Okay, maybe I'm getting carried away, but it is possible to combine them (and it is GOOD). Good enough to get three different combinations of the same two desserts!! Consider this one blessed and lucky day! You must have done something right today. Tangent: If its been a while since you've talked to a loved one, whoever it may be, can I suggest it as a great and wonderful thing. If you don't know what to talk about, try asking them about them. Often people will be fine talking if you ask them questions about their day, etc. You never know, this could be your lucky day. Give it a try and tell someone they are loved…and listen. 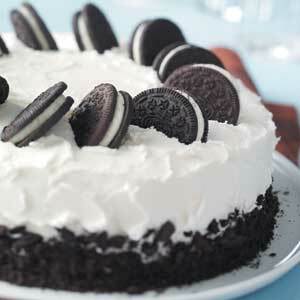 So, I was talking to my mom looking for more dessert recipes and she reminded me of the Oreo cake she has made. How could I have forgotten it?! 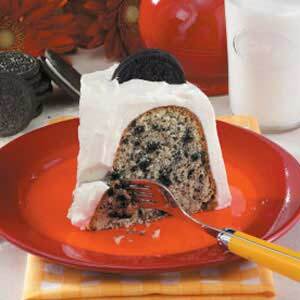 If you thought an Oreo was rich, woah…wait until you try this cake. It says it serves 12, but if I remember right, it was rich enough I needed s smaller piece! It is like eating an oversized Oreo. So if any of you get to trying the other two cake recipes before I get a chance, would you mind letting me know how it goes? Thanks! Once again, we love to hear from you! And I am really interested in those cakes…. Prepare cake batter according to package directions; stir in crushed cookies. Spoon into a greased and floured 10-in. fluted tube pan. Bake at 350° for 33-38 minutes or until a toothpick inserted near the center comes out clean. Cool for 10 minutes before removing from pan to a wire rack to cool completely. In a small bowl, beat cream cheese and milk until smooth. Beat in cream until mixture begins to thicken. Gradually add confectioners' sugar; beat until stiff peaks form. Frost cake. Garnish with additional cookies. Refrigerate leftovers. Yield: 12 servings. PREPARE cake batter and bake in 2 (9-inch) round pans as directed on package. Cool cakes in pans 10 min. Invert onto wire racks; gently remove pans. Cool cakes completely. MICROWAVE chocolate and butter in small microwaveable bowl on HIGH 2 min. or until butter is melted. Stir until chocolate is completely melted. Cool 5 min. Meanwhile, beat cream cheese and sugar in large bowl with mixer until blended. Gently stir in COOL WHIP and crushed cookies. PLACE 1 cake layer on plate, spread with cream cheese mixture. Top with remaining cake layer. Spread top with chocolate glaze; let stand 10 min. or until firm. Keep refrigerated. Yield: 16 servings. In a large bowl, combine the cake mix, water, oil and egg whites; beat on low speed for 30 seconds. Beat on high for 2 minutes. Gently fold in crushed cookies. Pour into two greased and floured 9-in. round baking pans. Bake at 350° for 30-35 minutes or until a toothpick inserted near the center comes out clean. Cool for 10 minutes before removing from pans to wire racks to cool completely. For frosting, beat the shortening, sugar, milk and vanilla in another large bowl until smooth. Spread frosting between layers and over top and sides of cake. Decorate the top with cookies and the sides with crushed cookies if desired. Yield: 12 servings.